It has about 20,000 genes - about the same as a human - and scientists say it sheds new light on genetic evolution. Presenting their results in the journal Science, the researchers also suggest it may lead to better understanding of the threat posed by endocrine-disrupting ("gender-bending") chemicals, to which amphibians are especially sensitive. Forty-eight scientists from 20 institutions collaborated on the study, led from the US Department of Energy's Joint Genome Institute (JGI) in Walnut Creek, California. "When human genome work was wrapping up around 2002, we were discussing what should be next," JGI's Uffe Hellsten told BBC News. "At that time there were a couple of furry mammals in the pipeline, and the chicken and at least two fish - but there seemed to be a gaping hole in the branch that constitutes the amphibians, and it seemed logical to fill that hole." 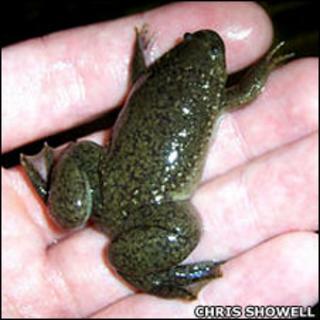 The species chosen - X tropicalis - is a close relative of a standard laboratory animal, the African clawed frog X laevis. This animal has been a staple of pioneering research in fields such as cell differentiation, the role of ribonucleic acid (RNA) and cloning. During the 1940s and 50s, their sensitivity to human hormones also led to their use in pregnancy tests. For this project, X tropicalis was preferred because it reproduces much faster than its more famous cousin. Its genome is also roughly half the size. That is because at some point in evolutionary history, the lineage leading to X laevis duplicated its DNA, meaning it now carries a double cargo of the double helix. The team reports that certain regions of the genome, clustered around specific genes, are remarkably similar to equivalent regions in the genomes of chicken and Homo sapiens - despite the fact that their lineages diverged some 360 million years ago. "When you look at segments of the Xenopus genome, you literally are looking at structures that are 360 million years old," said Dr Hellsten. "They were part of the genome of the last common ancestor of all birds, frogs, dinosaurs and mammals that ever roamed the Earth." However, it is the set of genes unique to amphibians that has excited conservationists. For the last few decades, frogs and - to a lesser extent - salamanders have been hard hit by a water-borne fungus, Batrachochytrium dendrobatidis. It is spreading across the world and has caused mass deaths in many species. It is implicated as the major factor in several species extinctions. Recently, scientists in several institutions have been working on a conservation strategy that would take naturally-occurring anti-chytrid chemicals from species that are immune, and use them to protect others. Xenopus appear to be immune themselves; and unravelling the genetic blueprint of its chemical defences could perhaps help to accelerate this line of research. "Xenopus is the genus from which chytrid was first recorded, in [a museum specimen from] 1938, and they seem to be resistant," said Robin Moore, amphibian conservation officer with Conservation International. "More detail on the genes that give resistance could also have massive implications for captive breeding programmes, helping us select animals that are resistant." A valuable next step, he added, would be to compare variants of these genes between amphibian species - especially from those that are highly vulnerable to chytrid. Dr Hellsten also suggested the sequences could shed light on the mechanism of endocrine-disrupting chemicals such as polychlorinated biphenyls (PCBs) - colloquially known as "gender-benders" - which impact many animals, but amphibians in particular because of their skin's high permeability. "Understanding the effects of these hormone disruptors will help us preserve frog diversity and, since these chemicals also affect humans, could have a positive effect on human health," he said.